Levi Leipheimer remained on course to win his third successive Tour of California title after winning the 24km sixth stage individual time-trial at Solvang to extend his overall race lead. The Astana rider came home eight seconds clear of fellow-American David Zabriskie to increase his overall advantage over Zabriskie to 36 seconds. 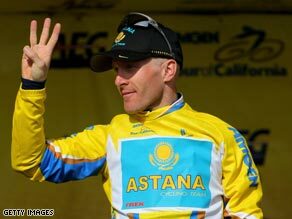 Australian Michael Rogers is up to third place overall, after finishing fourth on the day, while Lance Armstrong finished 14th — one minute and 16 seconds behind team-mate Leipheimer — to drop from fourth to sixth place in the overall standings, 1:46 off the lead.